Just as introduction, basically 1963 was void of many, many, many taken-for-granted practical inventions and lifestyle today. Color TV was not even invented yet ! There were no personal computers - and possibly not even dreamed of yet. No cell phones or smart phones. No Satellite TV or internet - and of course no internet at all or even dreamed of yet probably. The Presidential Assassination on November 22, 1963 is sometimes referred to as the first "media circus" in America - and as giving birth to the modern Live News casts on location. Because the assassination was obviously the "crime of the century" - and especially upon knowledge of the death of the President, all newscasts were broadcasting all tidbits blow by blow, minute by minute, of all the events unfolding. There was the initial witnesses pointing to a man seen in the 6th Floor window of the Schoolbook Depository and the Police rushing in there. And rapidly, events unfolded to the broadcast for a possible suspect and the finding of the apparent murder weapon and finding the suspect after minutes before of a local Dallas Police Officer gunned down in the streets involved in a possible arrest or questioning - whether related yet unknown. There were some processed movie clips being shown - and the famous Abe Zapruder being interviewed and the suggestion to get his home film processed as fast as possible. So we all know the history - as literally with in a handful of hours that some 'lone assassin" with a Communist background was arrested who worked in the Schoolbook Depository and was found to be the owner of the rifle found on the 6th Floor where he was working which included the three spent cartridges on the floor beside the window a man was seen in with a rifle - and as well was charged with the Police Officer homicide. And then the bizarre occurrence of the suspect murdered in the Police Building live on Television during the funeral of President J. F. Kennedy while he (Oswald) was in transport and by some supposed 'mafia' figure. The overall Conspiracy has engaged very early on to commitment. They committed to the murder weapon and the murderer and most importantly that the fatal shot occurred from the 6th Floor of the Depository Building - behind the President. All the evidence now going on immediately after the fatal shots have to agree with the shot from behind from the 6th Floor and that Lee Harvey Oswald fired the shots - only 3 - with the murder weapon found and spent shells beside it, 3. As to who knew what that was involved in the conspiracy can be arrived at with the intense conclusion of the case, all told. What immediately occurring after the assassination and pronounced death of the President was one of the first evidence tamperings by the illegal seizure of the dead president's body at Parkland Hospital to prevent a legal Autopsy under Texas Law and Jurisdiction. This was quite necessary as we find that part of the over all Conspiracy as persuading the Kennedy Family present - Widow Mrs. Kennedy and brother U.S. Atty. 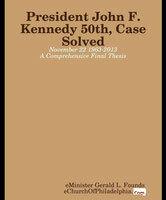 Gen. Robert Kennedy - to the hope of offering the limited findings to archives that "locked up" the evidence for that time period (see the Gift Law and either 25 or 50 years in Archives) - limited as also the knowing and suggesting towards the Kennedy Family to not allow some procedures of the Autopsy because of the "health secrets' of the President. We can see here (link below) the doings of the Autopsy that were in reality occurring step by step by the permission of the Kennedy Family present - Mrs. Jackie Kennedy (First lady) and Atty. Gen. Robert Kennedy (President's brother). Now upon verifying all these - it gives a very great dismissal of many, many instances of reference to the "autopsy was controlled by conspirators". That is really important as putting together the over all view of the Parts of the Conspiracy and those of suspicion or report or fact. (29) The committee conducted a review of all documentary evidence and contacted almost all persons still alive who had attended the autopsy. The Department of the Navy agreed to rescind the orders of silence issued to the autopsy personnel. (31) The evidence indicates that while the pathologists were given authority to perform a complete autopsy, the autopsy was not complete according to established medicolegal standards. 3. The remarks of others to expedite the autopsy were probably the reason for the decision to perform a less than complete autopsy. [The "Others".... (49) The belief that Dr. Humes had authority for only a partial autopsy derived from several factors. Special Agent O'Neill told the committee that he recalled that Mrs. Kennedy had given permission for a partial autopsy and that Dr. Burkley, the President's physician, reiterated her remarks in the autopsy room. (36) He believed there was no question that Dr. Burkley was conveying the wishes of the Kennedy family regarding a full-versus-partial autopsy. (37) Special Agent Sibert told the committee that he, too, had the impression the Kennedy family was somehow transmitting step-by-step clearances to the pathologists. (38) ]. (51) Adm. David Osborne (then captain) stated that at the beginning of the autopsy there was tremendous pressure to perform a "quick post" and to leave the hospital. (41) Following arrival at the Naval Medical Center and preparation of the President's body for inspection and autopsy, to be performed by Dr. Humes, chief pathologist and commander, U.S. Navy, Admiral Burkley, the President's personal physician advised that Mrs. Kennedy had granted permission for a limited autopsy and he questioned any feasibility for a complete autopsy to obtain the bullet which had entered the President's back. # At this point, it will be noted Dr. Humes, as the physician conducting the autopsy, stated it was his opinion that the bullet was still in the President's body and could only be extracted through a complete autopsy, which he proposed to do. # Special Agent Roy Kellerman, Secret Service, in conference with Special Agents Sibert and O'Neill, from an investigative and protective standpoint, advised Admiral Burkley that it was felt the bullet should be located. # At this point, Adm. C.B. Galloway, Commanding Officer of the National Naval Medical Center, Bethesda, Md., told Commander Humes to perform a complete autopsy. ==EDIT=> "Federal Agent" interferes with autopsy....Huh? (57) Stringer also stated that a Federal agent took a camera from Riebe and exposed the film. (52) This apparently occurred because the agent felt Stringer was the only person authorized to photograph the body and that Riebe was only to assist Stringer and not take photographs on his own initiative. Q. It should have been asked - who is in charge? A. "Adm. C.B. Galloway, Commanding Officer of the National Naval Medical Center, Bethesda, Md. " Q. What were his orders? A. "to perform a complete autopsy." Q. Were his orders followed? A. (31) The evidence indicates that while the pathologists were given authority to perform a complete autopsy, the autopsy was not complete according to established medicolegal standards. Q. What is the defense statement/position against Court Martial for disobeying orders? A. (76) Although Dr. Humes had authority to perform a complete autopsy, the committee still had to resolve the issue of the actual scope of the autopsy. Specifically, Dr. Humes may have decided on his own initiative to limit the autopsy in certain respects or, despite the initial grant of authority, some factors may possibly have surfaced during the course of the autopsy which may have impinged on the independent decision making of Dr. Humes. (77) Dr. Pierre Finck, one of the pathologists, asserted in a sworn statement to the committee that he believed the autopsy was incomplete. Because of the restrictions I suggested or said I felt it was not complete, but Dr. Humes then said that the autopsy had accomplished the purposes as stated-the number of wounds, the direction of the projectiles and the cause of death so I was actually satisfied. (98) Dr. Finck later stated that restrictions from the family (were) the reason for limiting our actions. Dr. BADEN. Now, for example, not exploring the wound from the back to the neck, that was not done. I mean, cutting it open completely. That wasn't done specifically; was that because somebody said, "Don't do it"? Dr. HUMES. Now wait a minute, that wound was excised. Dr. BADEN. The back wound? Dr. HUMES. Yes, sir. The back of the neck, and there are microscopic slides of that wound. Dr. HUMES. It was probed. Dr. BADEN. Was it opened up? Dr. HUMES. It was not laid open. Dr. BADEN. Now that was your decision as opposed to somebody else's decision? (79) The committee also investigated the possibility that the Kennedy family may have unduly influenced the pathologists once the autopsy began, possibly by transmitting messages by telephone into the autopsy room. Brig. Gen. Godfrey McHugh, then an Air Force military aide to the President, informed the committee that Attorney General Robert F. Kennedy and Kenneth O'Donnell, a presidential aide, frequently telephoned him during the autopsy from the 17th floor suite. (81) Dr. HUMES. There were no questions but we were being urged to expedite this examination as quickly as possible, that members of the President's family were in the building, that they refused to leave the premises until the President's body was ready to be moved; and similar remarks of the vein which we made every effort to put aside and approach the investigation in as scientific a manner as we could. But did it harass us and cause difficulty--of course it did, how could it not! Dr. BOSWELL. I don't think it interfered with the manner in which we did the autopsy. We have the later screwball lack of security of the Parade Route circumstance under complete suspicion and slight bewilderment. We have the "insider" Col. Prouty giving us the information missing on the actual intelligent factual read out about the normal Presidential Security doings for these Public Events and like events. I myself signed the Petition that was going around in the mid-1970s to reopen the case on the basis of the Military being stopped from performing their normal procedures for the Dallas Presidential Parade Route. Much the Public was being "turned on to" was from the basically first original publication that shot across the Nation like wildfire that everyone was reading or being told about that was the book 'Six Seconds In Dallas'. The Parade Route beginnings of "conspiracy theories" also was being the great puzzle as the story went that the Parade Route knowledge was not legally released until just two weeks before the actual event Nov. 22 1963. How did Oswald the assassin know to be on the Parade Route in the "kill zone" at least one month before, getting employment there - and two weeks before the Parade Route could have possibly have been known by anyone in Dallas including Authorities ? It is found it is leaked and there was the "persuading" of the entire trip to President Kennedy and all involved for the trip - the parade route itself of this being a trivial detail to him/them in the overall actual decision to go to Dallas and the politicking involved and the Public appearances. Presuming one person ordered the murder, they needed to be that inside of the U.S. Government itself. We have the presumed several parts of that. # The over all Military organizational part involving Parade Route Security and all logistics, lack of, of that. A major preeminent part of this is the Secret Service had the legal authority for any call up for additional protections and there was the "stand down order" to the 113th for Parade Route security. # The personnel, such as assassins and contacts and meetings and persuasions and all involved of putting the hit together, would lean towards C.I.A. type tactics - these professionally trained in these type orders. Recruitment. # Evidence tamperings and plants and all involved suggest the F.B.I. as being professionally trained in this area as well as investigations. So one person ordering the hit would apparently logically begin at the top - the Military. This would also coordinate all things such as arrangements and who among persons through CIA type abilities and then FBI type as far as all evidence securing all evidence to point to the commitment - the "lone assassin" with Communist background shooting from the rear - 3 shots only - that indeed was in place virtually within the hour. The 6th King is the head of "Red Communism" which attempted world dominion and was strategically put down by President John Fitzgerald Kennedy at the Cuban Missile Crisis. The 7th King is who defeats the 6th King (US - only available super power ability to do such) but the 6th King ("of the seven") becomes the 8th King who we all have heard about as called the Beast and 666 and the Devil's Champion and all the like who will rule 70 years including the years as underground ruler of Russia as the 6th and 8th King (underground - murder, bribery, assassination, paid votes, etc. - illegal activities to control) . Now we have the Allies defeating Hitler's Germany and world dominion attempt via false prophecy (dirt mountain - earthy) - as they are crying at defeat "Fall on Us - it is the Wrath of the Lamb [Jesus Christ second Coming] upon us"..... so that this "Mountain thrown into the sea" [defeat of their king of the mountain Adolph Hitler] shows two things. One, ironically is the event of false prophecy by Hitler [kill all Jews and God will not return] which later rests in the actual False Prophet under the Beast 666. Hitler uniquely was able to deceive the 7 kingdoms that will sit on the 7 mountains [underground kings and dominions in succession since the death of Jesus Christ to the End of Time] by practically indecipherable Scriptures interpretation and teaching [master race, eugenics, etc] which the 7 Kings are the witchcraft that rules. Two, is that though this is beyond the Prophecy revealed about the 7 kingdoms but included, it is understood that Christianity destroyed the evil and again at the Cuban Missile Crisis so that the obvious as saying JFK was operating at the instructions of the 7th King of the devil is not implied at all. "And the woman which thou sawest is that great city, which reigneth over the kings of the earth. " . C.18 V. 24 "And in her was found the blood of prophets, and of saints, and of all that were slain upon the earth". "God said it, I believe it" is a common saying of those of Faith. The importance is that all Christianity is taught, instructed, and believes beyond the shadow of a doubt that President John Fitzgerald Kennedy was martyred by the king of this evil City engaging antichrist world dominion. This only means that one person - the one king ordered his "execution". Looking over the Autopsy revelation that actually the Kennedy family was "controlling" this - it takes away a lot of a conspiracy as far as having to control those present and evidences as well - as quite easily simply maneuvering them into restricting the autopsy hiding JFK health history and sealing up the actual evidence into the National Archives for them. So, the point is the "size of the conspiracy" is really shrunken here by these events of the Kennedys themselves. Like the implication "could Organized Crime control the parade route and Wash. DC and the Secret Service and the Officers and the autopsy ? No, it is much bigger. " ---- in other words it is that lighter - smaller of all that were in on it, or controlled by it - the assassination conspiracy. What is the importance of that ? The importance is it would obviously be the 7th King (USA Underground) who ordered the assassination of JFK if that much of the American Government was being controlled or "on the payroll" and they all would have to have been that evil obviously to agree to it. It is simply that unbelievable that the USSR Underground government controlled that much of America. However - if it is just the handful of persons making arrangements (here dismissing for instance any outside control of the autopsy via conspirators thus the Medical Officers are not included as suspects ) - then these fewer could certainly have been approached from international sources as those of the underground Soviet Russia (USSR). This is along the same lines that US Organized Crime could not have reached that far into the American government, and so the other side of the coin - neither could have the USSR. In shorter terms, the actual conspiracy then to assassinate President Kennedy simply involved the ordered 'contract hit' by this head of "Red Communism" (Jackie Kennedy - "They killed him..." ) and those handful, only a handful, of traitors of the USA in those necessary strategic places to carry it out. The real conspiracy is then much smaller than imagined in size of persons, as some wild theories simply snowballed to almost the entire USA Government was "in on it" - being that absurd. However, let us not forget here that President Kennedy and the USSR President et al were negotiating and seeing the day very imminent in the very near future to achieve, finally, Nuclear Disarmament as the ending of nuclear hostilities. Now we look to President LBJ addressing the US Congress saying to "let's pass all these laws to honor President Kennedy " - which were a lot of the civil things and more. But, now President, Lyndon .B. Johnson never moved to continue the Nuclear Disarmament hopes of President J. F. Kennedy - but rather ushered the USA into the Viet Nam War with Communism into the millions of troops rotated throughout. However, when we get rid of all the Public Panic and fire of wild eyed conspiracy theories and vain misinformed beliefs that prevailed for all these years - it finally is melted down to the small handful of Government Insiders that indeed could and did pull this off, who could have been hired by either side - American or Russian "evil empires" members and rulers - observing that one king was ruler over all. So what is reported and testified to in various ways and how it happened are three gunmen targeting the President's head with electronic firing pins in their rifles wirelessly controlled to fire upon signal - and almost simultaneously. But why ? Paranoia one might miss ? It becomes obvious as very, very, very graphic was one desired effect. Another gruesome aspect is the use of the exploding tipped round which served to blow out enough skull so the conspirators (those of Secret Service) could easily and "plausibly" remove the remaining brain matter as destruction of evidence which is really an absurd amateur plan executed. One simple shot, as the Warren Report offered by Oswald, was not too dramatic graphically since Zapruder was right on the scene, either conveniently or coincidentally by chance. Neither could that one shot have done all the damage to the President's head as reported and testified to in various ways and times and primarily by the Parkland Hospital Doctors in Dallas testifying and commenting "about one third of the brain was blown away". In other words, the three shots including the explode-upon-contact round made the normal graphics dramatized greatly to two, three, four, five times the normal damage and graphic sight of it all. This becomes the reason for the over kill of at least 2 carbine rounds and an exploding tipped projectile. To wit, the rear exit wound was "about the size of a tight closed fist or small baseball". (Not actually verbatim testimony but close). So, if the Warren Report were truth - then we would have seen - by all released - the pencil sized hole in the upper rear of the President's head and about a baseball sized exit wound in the front. There you are. This is obviously not what has been seen by all the world. Remember, the baseball size hole in the rear of the President's head was described as a common exit wound of a high powered rifle such as the carbine and anything close to that reportedly of Oswald's found in Dallas. Embarrassingly enough, too, if shown - they would have to come up with the new second single bullet theory that showed the carbine size small entry wound in the rear of the head going out and then turning 180 degrees to come back in the front to make the exit wound the size of a baseball out of the rear of the head. Perhaps it exited and bounced off the windshield and hit President Kennedy in the front simultaneously. They could not claim the dent on the windshield trim above because they already lied and testified saying that happened before Nov. 22nd. No wonder the Warren report never reported on both two wounds in the rear of the President's head ! Or was it a Blue Elephant Gun ? UNFREAKINGLY UNBELIEVABLE ! COINCIDENCE ? I THINK NOT ! ! ! The appearance and graphics most particularly and solely of the Zapruder film show a most horrifying literally "blew his brains out" image in the world's minds and hearts. This is the apparent reason for this overkill (aside from evidence destruction) - a most dramatic visual display of President John F. Kennedy vividly and literally having his brains blown out in broad daylight right in front of the world. To make that point here - we all remember the suspected traitor being executed by the Viet Nam general in broad daylight on camera by raising a handgun close to his temple and pulling the trigger. It was the larger than trickle, slim stream of blood flowing as he fell to the ground. This is what was drastically dramatized in the President John F. Kennedy "execution" . See this You Tube - Graphic! Aside from the evidence value of that as to some sado masochistic personality characteristic of the one (s ) who paid for this execution or decided on it - the rest is then the obvious desired reaction of the world --- completely horrified. We enter mental health and can understand those guilty are deficient to choose such, which occurred intentionally and obviously. It is as they are trying to convince themselves as well in other words, that they are to now be that feared by the world which honors only their target and certainly not his killers. 7:10 And repayeth them that hate him to their face, to destroy them: he will not be slack to him that hateth him, he will repay him to his face. 23:21 ¶When thou shalt vow a vow unto the Lord thy God, thou shalt not slack to pay it: for the Lord thy God will surely require it of thee; and it would be sin in thee. EDIT: Found this live clip of "G.G. Slack"
Anti Electronic Weapons Defenses ? I think the question needs asking - was there satellite signal jamming technology to jam wireless electronic firing pin equipped weapon's frequencies and where these blocked or turned off for the assassination ? One more possibility concerning the wireless controlled electronic firing pin weapons of the three weapons involves the "umbrella man" and also the mentioned man with apparently a two way radio or walkie talkie type communication device beside him. In fact there was another also - two men with apparently walkie talkies in use at the time of the assassination. The radio man may indeed have been the actual wireless device that wirelessly fired the three weapons as already demonstrated. So in effect, this would actually be the person who killed President John F. Kennedy. Think of the James Bond movie "Golden Eye". Is this the second half of the 'Space Race' beginning aside from simple spy satellites ? As there is now satellite television and internet - of the beginnings of the 'Space Race' there may have been attempts to electronically jam nuclear warhead triggers and launch sites operations from the orbiting satellites. Of course, additionally, attempts at jamming communications in a war scenario. Was there additionally the jamming of wirelessly controlled weapons that could be fired, even remotely, to protect leaders and military and government officials from remotely fired weapons in any similar manner? Is this why modern terrorists might choose legally assigned frequencies such as cellular phones or other devices to remotely fire WMDs ? Now, with satellite TV dish receivers - in bad cloudy days the reception starts to fail and may suffer outages up to hours as in thick rain or snow clouds events overhead. However, they sell an add-on that is a sort of cover that fits over the dish that boosts signal for reception at these times. Radio specialist from Dallas. Was radio communications coordinator in Dealey Plaza. Placed in mental hospital run by the military. pg. 48: 12:32pm: "Jim Hicks, an eyewitness in Dealey Plaza, walks toward the knoll as the motorcade's press bus speeds by on its way to Parkland hospital. Photographs of Hicks, taken from the rear, show something in his back pocket resembling a radio with an antenna. (Hicks will later tell New Orleans District Attorney Jim Garrison that he was the radio coordinator for the assassination team. Shortly after admitting this to Garrison, Hicks is beaten up, kidnapped, and taken to an Air Force mental institution in Oklahoma, where he will be incarcerated until 1988. A few days after his release, Hicks will be murdered in Oklahoma.) It will later be suggested that Jim Hicks is possibly the man photographed in the Cuban and Soviet Embassies in Mexico by the CIA. He is identified incorrectly as Oswald in those photographs." Jim Hicks as well has been suspected as the "other Oswald" in Mexico before the assassination and it goes - is he the real trigger man of the assassination via the specially equipped weapons mentioned as depressing the dead carrier over the two way walkie talkie special frequency ? The other fellow with the "umbrella man" a decoy with a dumb-dumb radio in case of arrest ? Note it is not apparent the back/neck wounds of the President would have caused death by themselves, however the head shots did and are cause of death. Again, the Public now knowing indeed there was a conspiracy that day via released documents and testimony, we must reexamine everything with that "extreme prejudice" view. Everything is now suspect. Now can be explained the two "walkie talkie" guys photographed in the "kill zone" at Dealey Plaza the moments of the shots. We have the entry wounds on the rear of the President - two. One is the straight on puncture entry wound on the rear of the President's head about the top middle, and the other at the lower, below the neck area, which is also a straight on puncture entry wound - both shots from behind and straight on and not from the Dallas Book Depository Building to the side, both non-tangetial wounds. And we have the Govenor's entry wound from the rear striking him in the back which is tangential - from a side angle and not straight on as from the Dal tex Building area. There are several instances of researchers showing it is believed Governor Conally was shot with a seperate bullet from a side angle and not wounded with the "pritine bullet", which the Warren Report claimed did it - a single bullet striking Kennedy in the neck area and passing through to then strike the Governor, the infamous "magic bullet theory. NOW GO TO Chapter One and Two discussing the "electronic firing pins" used by the assassins and also the documented information about the two "walkie talkie guys" present at the assassination on sight. I am adding here the mystery solved about these two "walkie talkie guys" as the trigger men for the assassination. Review how the electronic firing pins of the assassins rifles were set for wireless firing control. And we have here the two - TWO - sets of these assassins. ONE is the two rifles set to fire almost simultaneously from the rear causing the neck and back wounds of the President and Governor repectively. The second set, three rifles, set to fire at the President's head. TWO firing teams with TWO wireless portable walkie talkies as the triggers, trigger men, of the wireless enabled electronic firing pin rifles. THESE were the actual spotters on sight with their green light given (perhaps "Umbrella Man" - Go!) that fired the assassins rifles in their pre-planned fashion for purposes explained. So for the record to date - and this is like the "Clue" game like Col. Mustard did it in the Living room with a pipe - I am pointing to (and from religious knowledge) that the man identified as the Beast666 in the Holy Bible (Authorized King James Version) is the person responsible for the "hit" as the mastermind who paid for it. In 1963 he was identified as the underground "king" of Communist Nations worldwide that was called "Red Communism" (Sixth King/Head/Mountain) . This was a reciprocity vendetta killing against the person of President John Fitzgerald Kennedy for the embarrassment caused by him at the "Cuban Missile Crisis" to this underground leader - as much as it was the blocking of the President Kennedy Administration and all it stood for as far as World Peace which included the end of nuclear hostilities via nuclear disarmament. It was knocking on the door of the devil himself, which world peace would be the ending of his rulership for all intents and purposes, and he struck back with the assassination and great fear caused by the violence of President Kennedy's "execution" in broad daylight and ensuing cover up activities (many witnesses killed) in the exact manner it occurred for all its theatrics that were so painful to live through to this day. Obviously as well, after the terrible assassination, international crime would now flourish as Law and Order would not prevail ever so closer into every dark corner worldwide with the "Super Powers" now working closer and closer to secure a civilized world free of the scourge of war and crime in general. This in effect (world peace achieved) would have put Satan and the Beast666 out of business, as is known would not occur at that time - "Elisha must come first". 7 ¶And as they departed, Jesus began to say unto the multitudes concerning John, What went ye out into the wilderness to see? A reed shaken with the wind? I believe David Ferrie fired the carbine shot from the rear (1st head shot) for reasons later explained, and the USSR assassin (we will name him) fired the exploding tip round (2nd shot) from the wall of the Grassy Knoll who may have been the "KGB Agent" described by Frank Sturgis (YouTube below) and he is shown as Black Dog Man caught on film shooting. Most likely the "Badge Man" I believe shot a blank round plus causing "the smoke", to decoy away from the explosive tipped round shooter as mentioned above, and the muzzle flashes shown on film with great efforts - as an exiting carbine round from JFK's head would have also killed Jackie if shot by the "Badge Man" with a carbine. Also remember witnesses at the Grassy Knoll area at the time of the fatal head wound described two shots "right on top of each other like bang - bang" - the second "bang" that third simultaneous shot from the overpass area, the first being the exploding tipped round (and rear shot before that). Witnesses described this also as very loud - which would have been the explosive tipped round having more gun powder and louder than a carbine type weapon and round. Testimony by witnesses did say they saw "smoke" from behind the picket fence of the Grassy Knoll. I believe this is a further intended decoy away from the actual assassin behind the cement retaining wall firing the exploding tipped round - being who he was and preeminence as to escape. In other words if there was, for them tragically, the need of a "fall guy" at the Grassy Knoll - then it would have been the "Badge Man". Some of the nonsense perhaps if they all were caught would go like.... For all intents and purposes the first round (bullet) shooter and the wireless trigger man should be the assassins charged with the murder via the first rear carbine shot that was indeed the first of the almost simultaneous three shots that struck President Kennedy's head. That exit wound in the front was obliterated by the explosive tip round that after struck the front. The rear shot of the three has been shown in the Zapruder Film with great efforts as indeed the first of the three almost simultaneous shots to strike President Kennedy's head. This equals as one holding and aiming a rifle and another pulling the trigger. Of course in their buffoonery they would probably have argued that neither of them could be charged for the murder because either of them did not aim and shoot. The first aiming the gun would argue he did not shoot it and claim not guilty. The actual wireless trigger man would argue he did not know who or what the gun was aiming at even though his wireless device made it shoot and plead not guilty. The other two, the shooter of the exploding tipped round which struck the head from the front right side and the carbine size round striking from the front leaving the 'baseball size' exit wound in the rear of the head - in that order by the wireless delay as almost simultaneous hits - may have argued 'you can not kill a dead man' meaning he was instantly dead from the first head wound shot of the three. But to amend this, in reality it was all three shooters and the trigger man, as the death was not actually within hundredths or thousandths of a second or instantly by any one of the three shots striking the President's head almost simultaneously. The President was still alive for up to several instants or seconds beyond the timing of the second and third almost simultaneous shots. Was the President DOA ? Yes - though arguably during emergency resuscitation there were recorded I believe one or two breaths and one to three heartbeats at Parkland Hospital by the attending Physicians. This can be arguably "artificial". (Note that there is a tangential wound as opposed to a neat entry puncture wound from gun shots. The tangential wound is an entry wound from an angle but is not neat and round, but rather like elliptical shaped as entry - and we find the Warren Report photos/others/drawings showing this wound (rear small hole) does not have any likeness to a tangential wound, but rather shown is as the neat straight-on puncture wound. This means it is apparent this shot came from the DalTex Building which was on Houston Street facing straight on at the Parade as it entered the "kill zone". That direction would line up with the straight on neat puncture wound (small hole) seen on the back of the President's head and supposed to be from Oswald's only head shot. ANOTHER EPIPHANY here as a last minute entry is that this can also explain reasons the front and right exploding tipped round from the Grassy Knoll area wall was planned, also as reasons from that direction, to give the appearance to the rear shot being from the Book Depository Building (Oswald) angle - back and to the right - striking the head giving the President the appearance as violently jerking to the left from the impact from Oswald's shot that we know never happened. I have always felt Abe Zapruder was on their payroll and not the innocent bystander he was made out to be. The fact of this essence of their enterprise - framing Oswald in the 6th floor "sniper's nest" - is then revealed as their plan from the beginning and committed irretrievably to it, and explains why and how the Zapruder Film was employed..... actually as support of the final product - the Warren Report of the President's Commission on the Assassination of President John Fitzgerald Kennedy. And now I firmly believe beyond suspicion that Zapruder was part of the conspiracy for his contribution as an obstruction of justice to prosecution of the real murderers. As well this shows the degree of their "professional military style" execution called today a "state sanctioned" hit. All head wounds were fired to frame Oswald at his position and hide the others from theirs. Massive plot, massive planning. In the pictures, start at just a little to the left of center to focus on the end of the rifle barrel pointing right at (you) JFK. You will then see apparently on the right a seemingly dark overcoat pulled half way over the left side of the head which is facing the camera meaning on the right side of the snapshot. Identifying this you will see the face appearing with glasses like sunglasses which is staring right down the scope on the barrel of the rifle. He is wearing a hat that appears as a Lawman's cowboy style hat somewhat like the traditional State Police style lawmen hats. Note also the rifle is being propped by the left hand open (four fingers) resting in between thumb and index finger, his arm straight up and down resting on the wall and the rifle resting on hand. You can even see he is wearing a wrist watch on the wrist propping the rifle and the long sleeve shirt light colored. As well there is apparently a badge on the hat which may be the crimped style Police cap. It seems the grassy Knoll assassins were all wearing fake or stolen Dallas Police uniforms that day and makes sense that as they were running away, witnesses actually thought they were the Police chasing the assassins. The snapshot is an instant before the fatal shots are fired. Names the SECOND SHOOTER as a "KGB Agent"
SHOOTER NUMBER THREE DOWN AT OVERPASS? SHOOTER REVEALED AT GRASSY KNOLL FENCE - "BADGE MAN" - apparently fired a dummy round with plenty of smoke effect giving cover to the 2nd shooter. ADDITIONAL SHOOTERS ? ONE WITH APPARENT SILENCER - FIRE CRACKER SOUNDS ? Direct evidence shows Parkland Hospital Doctors, witnesses - all testify to about one third of President Kennedy's brain had been blown away altogether, missing. However, upon arrival at US Navy Bethesda Hospital - and in a different casket - direct evidence and testimony reveals that there was 'less than a handful' of President Kennedy's brain present and every one there 'gasped' when they saw it (official Autopsy proceedings). This means the certain of the Secret Service where the only ones in control of the body in the casket from the Parkland Hospital to the Presidential jet to Bethesda Naval Hospital. These only had disposed of the "missing brain" - the only time alone during the swearing in of the Vice President Johnson into the presidency (this is when Jackie Kennedy left the casket and went forward) was when the gruesome illegal actions took place of the disposal and most likely flushed in the jet bathroom toilet and then flushed in flight, or any variation in theme. This was the only time when no one else was with or looking at the casket aboard the jet. It was virtually the only time those certain of the Secret Service was/were alone with the dead President in the casket without anyone else present. Not at Parkland. Not at Bethesda. On Air Force One. You can imagine the reaction in the Bethesda autopsy room when JFK was placed on the table. Paul O'Conner (autopsy tech) testified/reported there was a loud "gasp" by everyone seeing it. Thoughts racing, hoping perhaps there was some explanation.... but in the dark thoughts realizing the body had been altered somewhere between Parkland Hospital and the Bethesda autopsy room. I can imagine the "my God, someone cut his brain out" thoughts coupled with "Who?" and "Where?" . The strange timing of the entire event of the oath of office performed to swear in V.P. Johnson may have been, and probably was, prearranged - to stage any destruction of evidence hastily and even when the Oswald rifle bullet fragments and "surgical alteration" took place - wedging the Oswald rifle fragments into the skull bone, and some of the skull had the appearance of surgical alteration - jagged cut away around wounds. This was only done no doubt to destroy evidence of the residue from the exploding tipped round (mercury?) - the second almost simultaneous of the three shots hitting President Kennedy's head, the exploding tipped round - along with, most likely, a metal detector to remove bullet fragments and subsequently implant fragments to implicate Lee Harvey Oswald who was the 'patsy' designate from day one before the assassination ever occurred. As well, this reveals that although President Kennedy was placed in a donated bronze casket in Dallas (weighing about 1,000 pounds) sheets about the head and a plastic type liner, at the autopsy room he arrived in a military style simple "pinkish grey shipping casket" (weighing about 40 pounds) and military style body bag. It reasons that the guilty of the brain disposal and casket switch (those of the Secret Service, and all parts of the pre-planned conspiracy) - it reasons that they hoped on bluffing their way through avoiding suspicion with the hideous crimes committed as Bethesda personnel would be assuming perhaps this was done first (removal of brain as National Security forensics evidence) elsewhere and general puzzlement would prevail, and even maybe somehow it was left in Parkland and so on. What was absurd about this, the entire missing brain chapter of the litany of crimes committed in the assassination conspiracy, is well explained by Paul O'Conner of the autopsy staff who was given Military Permission to testify/comment that among his duties would have been to remove the brain according to protocol for the autopsy and forensics. He well explained how this was performed according to autopsy procedures. There is quite a specific manner as special saw cutting the skull and the scalp pull back type stuff and cutting connecting parts as to eyeballs inside before the brain is actually removed. What is absurd is that the massive head wound, skull and partial brain blown away, was enough an opening for criminal removal of the remaining brain easily without alteration of the skull - but obviously existing in this condition there is no one in an autopsy profession that would have removed the brain for forensics (bullet path directions etc) in that manner, just "pulling" or "scooping" the brain out through the existing gaping hole. It would have destroyed the brain as far as any forensics possible aside from being against the law as willful destruction of evidence. At best it had to be sectioned out as Parkland Doctors testified only "one third of the brain was blown out". Gruesome stuff ! Further, evidence public reveals the presidential limousine was hosed down in Dallas and later the windshield was removed and other changes. Of note, all considered from evidence and interviews, apparently former US Atty. Gen. Senator Robert F. Kennedy (JFK's brother) retrieved the "canister" with the remains of JFK's brains ("less than a handful") from the National Archives and buried them with JFK when the casket was reinterred. This was the other flash rumor and news "the President's brain is missing" which was about the National Archives - brains container missing. As far as the Zapruder Film being "doctored" - changed in any manner, there is an eerie coincidence in the Holy Bible to be considered. That is that Frame 313 (head shots) being the desired "fixed frame" for presentation adds credence to those of the Researchers great efforts that point to beginning frames are indeed missing - and even a reported eye witness who saw the original saying a lot of the beginning was removed. (Claims in the original the Presidential Limo was seen almost running over the curb/sidewalk in the turn from Houston to Elm. As well that the Limo indeed came to a complete stop at the "kill zone" spot until after the shots, etc. ) So most likely the film - frame by frame was cut off from the beginning until they played it back and Frame 313 exactly was the head shot. This indeed may account for the missing frames in the beginning of the film. 3:13 Thou wentest forth for the salvation of thy people, even for salvation with thine anointed; thou woundedst the head out of the house of the wicked, by discovering the foundation unto the neck. Selah. Coincidence ? 313 - Head Wounds, neck wounds ? No. It was doctored to point to this. It is a "confession" if you will. This reveals religious persecution beyond murder and assassination. If you will remember the one clip I added that contained the "Opal Bust" which was a sort of micro dot implant photo in the photo which I now recognize as the mask faces on the Three Stooges introductions - the smiling face and pouting face. Here it was the smiling face mask. What does that mean ? It points to who in the Bible ? The three stooges - False Prophet and two princes. Blaming it all on them as being guilty as false prophets telling lies - the accusation "...thou woundedst the head out of the house of the wicked..." - as in other words "America is the Great Satan". Special note here was that ironically the off beat remark went through America after these assassinations of JFK, RFK, MLK - Kennedy, King, Kennedy - that notice there names all end in capital "K" so that altogether they are "KKK" . Hmmmm. Their calling card? This was sentiment. 10 And I heard a loud voice saying in heaven, Now is come salvation, and strength, and the kingdom of our God, and the power of his Christ: for the accuser of our brethren [Satan] is cast down, which accused them before our God day and night. Did you notice the reversal ? 9-11 ? Reportedly the attack by the one who is believed to be the False Prophet himself here at Revelation 9:11 points to the Beast did it ? Coincidence ? No, an 'insider' and why the date 9-11 most likely to point to this all. The false accusation - "America the great Satan". Zapruder Film Altered? Three different films synchronized, then all three would have to be altered!